Gardeners are pretty funny. When others are grousing about the rain, we’re out in it, lapping up its drops. Like parents, we’re gleeful for the joy it gives the dear ones in our care. Last weekend, the rock rose (Pavonia lasiopetala) and turk’s cap (Malvaviscus arboreus var. drummondii) along my back fence forgave me for everything they think I’ve done wrong. When the rain’s but a tease, we quickly sow seeds and dig holes, in hopes that their second drink will be one that doesn’t come from a hose. Or we run for the camera. I pulled off my gloves for this one of cosmos against purple sweet potato vine (an Ipomoea, like morning glory). Both are annuals for us, but this picture will remind me that I’ll do it again next spring. Spring bloomers showed up again. In the cat cove, a wayward sunflower chose a spot to get next to a fellow yellow, Calylophus berlandieri. Thanks to severe pruning a few weeks ago, the zexmenia (Wedelia hispida or Zexmenia hispida) celebrates again in fall. The crossvine (Bignonia capreolata ‘Tangerine Beauty’) also likes autumn almost as much as spring. The big surprise was this one next door to it on the back fence. This pink trumpet vine/desert trumpet vine (Podranea ricasoliana) suddenly got busy. It dies back in winter (though not last year for me in east Austin). I discovered it beyond the mountain laurels while testing the soil temperature in the lettuce bed. 70º, just about right. My chart says 40- 75º, the 75 being ideal. Weeks ago, I ladled in compost, fertilizer and bunny poop. I turned it a few times, let the bits of rain fall on it, and did a final turn last weekend. I watered it lightly, then planted lettuce seeds, a couple of Buttercrunch and parsley transplants, and watered again. I only planted half the bed. I’ll do the next half in a few weeks to keep things going. In the bunny garden, I turned in compost and fertilizer and planted cilantro, arugula, and Swiss chard seeds. And I planted wildflower seeds. Now’s a good time to get those in the ground. Even though some think that autumn is winding down time, for us it is a renewal. And after two miserable years, it’s a time for ideas. 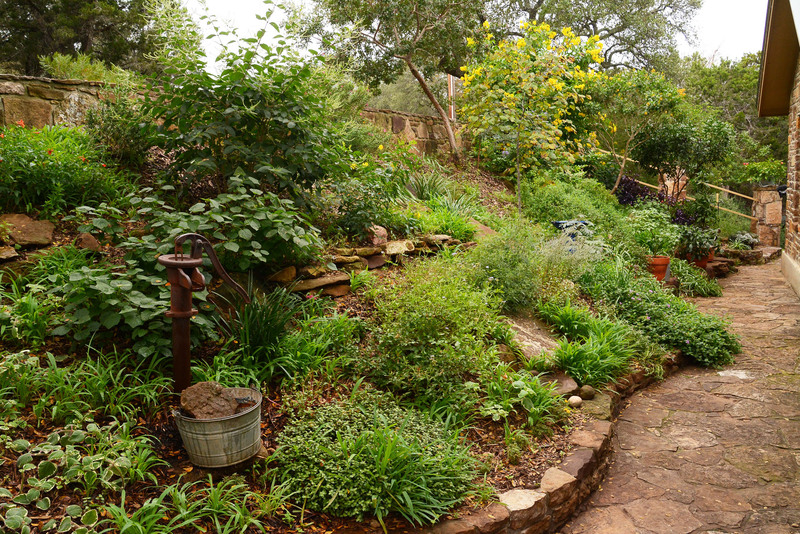 You’ll find both renewal and ideas at The Garden Conservancy’s symposium, Limestone & Water, on Saturday, Oct. 31, at the Lady Bird Johnson Wildflower Center. The night before, landscape architect James David and Gary Peese host an exquisite reception in their garden. At the symposium, Stephen Orr, garden consultant & writer, addresses Smarter Gardens: Gardening With Less But Getting More. Local designer Dylan Robertson looks at the Outside You can Live in. And, Lauren and Scott Ogden share their philosophy of plant-driven design that honors plants, place and spirit. This week on CTG, they join Tom to renew our spirits and ideas with their passion that ignites a few concepts to enrich your perspective as you plan this year’s changes. For more details about Limestone & Water, the Friday night reception, and to register online, visit The Garden Conservancy’s site. And, since we’re all stampeding to the nurseries to renew our gardens, Trisha demonstrates how to pick the right plant. Find out how to know the one to leave and the one to take.